I had everything prepped and ready to go; the rice and beans for the gallo pinto was made, coffee was in the machine waiting to be brewed, everything was cut up, a giant bottle of Lizano was procured, the plantains were ripe and the tofu was in the oven when my friends started to arrive. Then the universe conspired against me. First, the internet was down because my modem isn’t working at the house so I couldn’t access my glorious recipe for gallo pinto. I can wing it for sure but I spent so long perfecting the recipe that is was such a disappointment that I couldn’t use it. Then right as the plantains were frying the coffeemaker overflowed and while hot coffee was flowing everywhere but the pot the plantains were burning away in the cast iron skillet! Que lástima! Luckily my friends brought plenty of alcohol to dull my feelings of cooking inadequacy and the meal was still good but I want to do the exact same thing and make it right next time! We have plenty of Lizano now so I can do multiple attempts! I had such a fun time hanging out with you guys! Thanks for coming over! 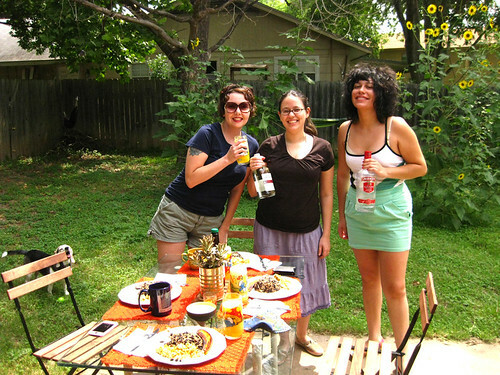 This entry was posted in Austin and tagged brunch, cooking disaster, gallo pinto on June 7, 2010 by lazysmurf. That Lizano was amazing!! Look at us girls. Super hot like the day it was.